Milligan’s take on these rage-fueled monsters is absolutely unparalleled and a diamond in the rough in the “horror” genre for comic books. “Together with our hellish hate… We’ll burn you all-that is your fate!” may not truly fit the theme of Peter Milligan’s recent run on Red Lanterns. Atrocitus, leader of the Red Lantern Corps, begins to fear that his rage, his power, is dwindling. Tired of his fellow feral Corps members, he decides that one other member will be given full capabilities, speech and clear thought, and stand as his second-in-command. He finally decides on Bleez, a “tragic heroine” if you will, a survivor of horrid atrocities committed against her. Having been kidnapped, raped, and tortured, Bleez’s story is harrowing and amazingly human. This is where Milligan’s work truly shines. Many other Lanterns’ origins are covered as well, though the most unexpected ones tend to be the most shocking and the most saddening. There are characters whose stories steal the show for an issue or two, like Skallox, who was burned due to a false accusation, or Ratchet, who was tortured because he had physical contact with another creature, a serious offense in his society. 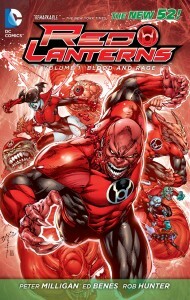 Bleez and Atrocitus carry the story for the first few issues, but a background story slowly becomes more prominent. This story focuses on Jack Moore, the “geeky” brother of Raymond Moore. Jack sees his grandfather brutally murdered and must repress his emotion in order to deal with his brother. After a confrontation with the police, Jack is left alone and angry. He is so angry that Guy Gardener’s abandoned Red Lantern ring finds and bonds to him. This is where we finally are treated to the first human Red Lantern: Rankorr, Jack Moore of Earth. The characters only add to the plot that is just as enthralling as it is brutal. Death, destruction, and even sexual undertones lead the more macho-masculine stories, whereas empathy, humor, and even compassion lead the more driving origin stories that make this arc so awesome. I know, compassion in Red Lanterns!? Blasphemy! It doesn’t feel out of place, though. Instead, it feels natural. This just goes to show Milligan’s ability to deliver a story despite the animalistic characters and concepts. Revenge, anger, and violence are the themes of these issues, and yet he makes these monsters more human than most other Lantern Corps. We see that maybe, just maybe, there’s more to these creatures than their hate. Atrocitus, for example, has a relationship with Dex-Starr, his cat, like any other person would. Dex-Starr often is seen with Atrocitus, as they’re friends, companions. Personally, this feeling of misunderstanding is a drawing factor to Red Lanterns. Sure, they may have napalm for blood, foam when they “speak,” and lust for the destruction of all who have done wrong to them, but maybe they’re nice guys. Or this is just a phenomenally written comic. I like to think it’s the former. The artwork only adds to this feeling of awe as you turn each page, or in my case, swipe your iPad. Traveling through space and time, each location feels fresh and (excuse my repetition) awesome. As the plot progresses, we get some awesome shots of a decaying power battery, and scenes of destruction and war a few bodies short of an apocalyptic battle. Whether Atrocitus’ search for his failed Red Lantern prototype, or Jack Moore’s close-to-home rage, the plot never leaves you bored, there’s always something around the corner waiting to vomit napalm all over you. Red Lanterns: Blood and Rage is definitely one of the stars of the “New 52.” Milligan’s take on these rage-fueled monsters is absolutely unparalleled and a diamond in the rough in the “horror” genre for comic books. The plot takes you on a crash course through the worst aspects of humanity: tragedy and the ensuing tragedy, and how everyone feels this no matter where in the universe you’re from. A refreshing look at the darker Lantern Corps, Red Lanterns: Blood and Rage is a must-read if you like horror, philosophy, or comic books in general.